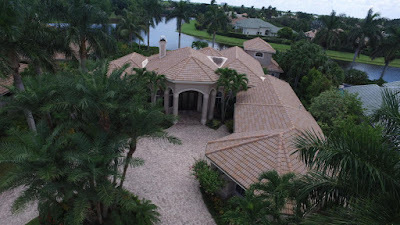 Florida Real Estate: Ballen Isles Estate Just Listed! This exquisite estate on a spectacular resort lot with triple lakes and golf course views in the envious Ballen Isles of Palm Beach Gardens. This home is fully updated with state of the art automated lighting, window shades, black out triple shades in the master bedroom and hurricane impact glass doors and windows throughout home. The master suite features his and hers baths, exotic granite counter tops, and large walk in closets. The chef's dream gourmet kitchen has a full suite of top of the line stainless steel designer appliances, a bread warmer, and side by side Sub Zero refrigerator and freezer. The wet bar includes an ice maker with a unique purification system unlike any other. The gorgeous open family room encompasses celebrity designer hand made floating staircase that ascends to loft suite that has a large walk out deck extending over vast views of luxurious grounds. This is the perfect home for the outdoor entertainer that wants the "Wow" factor with a swim up grotto and waterfall seating, and your screened in area includes a gourmet TEC thermal grill, and space for plenty! This home is behind the gated area of "The Grands", and you must see to truly appreciate this elegant home.